The 2015-16 men’s basketball team posted a historic season, with an Atlantic 10 Championship and NCAA Tournament invitation. Under the direction of Phil Martelli, head coach since 1995, the Hawks’ 28-8 record marked the second most wins in program history. The team advanced to the second round of the NCAA Tournament, where it was edged out by top-seeded Oregon. Standout forward DeAndré Bembry, named the 2016 Player of the Year by both the A-10 and Philadelphia Big 5, was selected 21st in the NBA Draft by the Atlanta Hawks. He is the sixth Hawk to be drafted in the first round, and the first since 2004. The Big 5 named Martelli Coach of the Year for the fourth time, and, along with the A-10, chose forward Isaiah Miles ’16 as the 2016 Most Improved Player. Notching one of its most successful seasons, the men’s cross country team captured the Atlantic 10 title for the fifth time, with head coach Mike Glavin garnering A-10 Coach of the Year honors in as many years. The Hawks finished second at the IC4A (Intercollegiate Association of Amateur Athletes of America) Championship. The men’s lacrosse team captured its third consecutive Northeast Conference (NEC) regular season title. Head coach Taylor Wray was tabbed NEC Coach of the Year and Mike Rastivo ’17 became the first SJU men’s lacrosse player to earn the distinction of Honorable Mention All-American by USILA/Nike. This year, Saint Joseph’s teams boasted a cumulative GPA of 3.11, and a record 348 student-athletes were named to the Athletic Director’s Honor Roll. Based on their multi-year Academic Progress Rates, eight teams earned NCAA Public Recognition Awards: men’s cross country, golf, men’s and women’s soccer, men’s track, women’s lacrosse, women’s rowing and women’s track. Additionally, Hawk athletes participated in more than 2,500 hours of community service, including the Thanksgiving Food Drive, the MLK Day of Service and Hawks vs. Cancer. 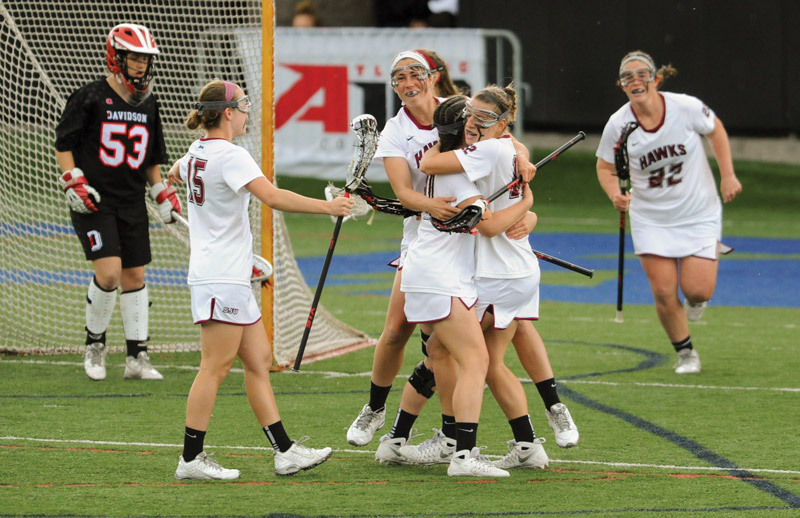 Women’s lacrosse celebrates its first A-10 postseason win since 2009. Catcher Deon Stafford Jr. ’18 was recognized as a Third Team All-American by Louisville Slugger and an Honorable Mention All-American by Perfect Game/ Rawlings. He turned in one of the best single-season performances in Saint Joseph’s baseball history, batting .395 and setting new single season records with 85 hits and 18 home runs. Saint Joseph’s 2015-16 teams collectively posted among the highest cumulative winning percentages in SJU history. In addition to the conference titles won by men’s basketball and men’s cross country, the baseball, softball, women’s soccer, women’s lacrosse and men’s lacrosse teams competed in the postseason championships for their respective conferences (Atlantic 10, Northeast Conference).